Potato Salad, Balsamic Vinaigrette, Thyme for Cooking, simple for summer. This is a simple potato salad. dress with a Balsamic Vinaigrette and sprinkled with herbs. Slice the potatoes for salad. When water is boiling, add potatoes, partially cover and cook just until tender when pierced with a sharp knife, 10 - 12 minutes. Roughly chop celery. Snip chives. Whisk vinegar and mustard together in a bowl large enough for the salad. Slowly drizzle in olive oil, whisking constantly until well combined. 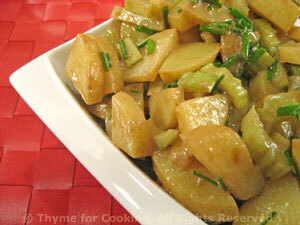 To finish: Add potatoes to vinaigrette and stir gently.